Manado Tua Island. 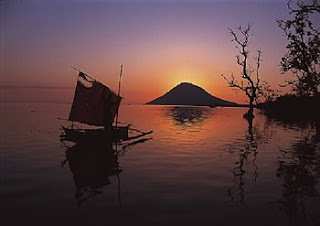 Manado Tua is the main island of the Manado Bay group. A path to the top of Central Mountain takes several hours to climb, but the view takes in all the islands in Manado Bay. The beach is a mixture of white sand and coral formations. The reef lines the coast of Tangkoko Batuangus in a nature reserve. A permit should be obtained from Sub Balai Konservasi Sumber Daya Alam (Nature Conservation Office) in Manado, before heading for this reserve.